Defeating the AI is extremely easy when using legitimate methods. Simply make a lot of money and buy the opponents out. But, if you don't like to use legitimate means, there are a clever techniques (also called cheats) that you can use to harm the computer's companies. The rival's train is destroyed! Unfortunately, so is yours. Beware, the ratings of your nearby stations will plunge to near zero. The rival's ratings will remain unchanged (darn!). You must wait until the remains of your train are hauled off to the scrap yard before you can bulldoze the depot. There is a bug in the way TT (all versions) handles ownership of rail lines. This bug can be used to your advantage to trap the rival's trains. Build a rail line out from the end of a rival's station. Build roads (grade crossings) on all squares. The AI will think it own these squares, so instead of turning around, the rival train will travel ahead on the rails! When the train reaches the end, destroy the track between it and the station, and it will be trapped! Now the train will go nowhere fast, and it will still cost the rival to maintain it! Unfortunately, this only works with stations that have free space behind them. Also, because you need grade crossings, you can't curve these rails. Let the rivals destroy themselves! Using the same trick as in the last item, connect two rival train stations with tracks and then build grade crossings on each square. The stations must be directly across from each other and at the same elevation for this to work. Once the grade crossings are in place, the AI thinks that the two lines are connected! Trains from one line will cross over to the other, possibly resulting in a collision. If two rival trains collide, both are destroyed, and your ratings remain unaffected! 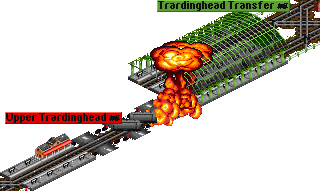 The picture shows two trains colliding with each other. The red train (top left) collided with the green train (lower left) which was parked in the station. The ratings in the red company's nearby stations dropped to zero but the green's remained the same. As soon as the rubble was cleared away, both companies shut down these stations. Note: In the above picture, the red train would not have be able to enter the green station, and vice-versa. If both stations were owned by red, then the red train could cross over to the other line. If you deleted the connection, that red train would be trapped in the other line and would lose money and risk a collision with the other red train. Make sense? You can sabotage the rival's signals so they will be red, even if no trains are around! Build a rail line from the back of the depot to the end of the station as shown in the picture. A bug in the way TT handles depots will make it think that your rails are owned by the AI, causing the signal system to malfunction. When a train comes near the station, the signals will turn red, so the train has no choice but to go to the depot. Paradoxically, it's the train itself that causes the signal to turn red. In effect, the train is trapping itself! After entering the depot, the train will be forced to backtrack the way it came, away from the station! The train won't ever make a profit, but the AI will still have to pay maintenance for it. Kaboom!! The truck is wrecked, and the ratings of the rival's nearby stations fall to near zero! However, your ratings are unaffected. Repeat this until all of the road vehicles on the opponent's route are destroyed. Then, after a month or so, the computer will close the stations on that route, and it will be all yours for the taking! You could destroy their road vehicles, but what if you could make them go around in circles forever? If you coax a rival's road vehicles onto a road, and then destroy the road behind and in front of them, they are trapped! They will drive up and down the road, incurring running costs, losing their reliability, and depreciating in value! All with minimal costs to you. The hard part is coaxing them onto your own roads. Since the rival's roads tend to be laid out horribly, you should try to build a better, shorter road between the rival's stations. Road vehicles always utilize the shortest route, so they will use your road instead! Destroy both ends of the road when the rival's vehicles are on it, and voila! Destroying road vehicles is a neat trick, but it gets old fast. Another entertaining thing to do is to block their road vehicles with your trains. Simply build a rail line over an opponent's roads, build a train, and park it right in the middle of the grade crossing. Those trucks won't be going anywhere soon! Unfortunately, in doing this you lose use of the train, and its value decreases. But, in fact, you don't actually need a train permanently parked there. Have your train head towards the grade crossing. The instant the flashing lights come on, reverse the train. If timed perfectly, this maneuver will result in the flashing lights staying on indefinitely, even after the train is miles away. The trucks still won't be able to cross, but you don't have to park your train there!